This is a list of broadcast station classes applicable in much of North America under international agreements between the United States, Canada and Mexico. Effective radiated power (ERP) and height above average terrain (HAAT) are listed unless otherwise noted. All radio and television stations within 320 kilometers (about 200 miles) of the US-Canada or US-Mexico border must get approval by both the domestic and foreign agency. These agencies are Industry Canada/Canadian Radio-television and Telecommunications Commission (CRTC) in Canada, the Federal Communications Commission (FCC) in the US, and the Federal Telecommunications Institute (IFT) in Mexico. A (formerly I) — clear-channel stations — 10 kW to 50 kW, 24 hours. The old Class I was divided into three: Class I-A, I-B and I-N. NARBA distinguished between Class I-A, which were true clear-channel stations that did not share their channel with another Class I station, and Class I-B, in which a station operated with 50 kW at night but shared its channel with at least one other I-B station, requiring directional operation. This distinction was superseded by the Rio Agreement, which instituted the current class system. Stations on the AM expanded band, 1610 kHz to 1700 kHz, are limited to 10 kW days and 1 kW nights, non-directionally. Field strength is limited to 140 mV/m (millivolts per meter) at 1 km. TIS/HAR — travelers' information stations / highway advisory radio stations — Up to 10 W transmitter output power. Stations within US national parks are licensed by NTIA and not the FCC. In the Western Hemisphere (ITU region 2), medium wave AM broadcasts are on channels spaced 10 kHz apart from 530 kHz to 1700 kHz, with certain classes restricted to subsets of the available frequencies. American territories in ITU region 3 with AM broadcasting stations (Guam and the Northern Mariana Islands) use the 9 kHz spacing customary to the rest of the world. All stations are class B or lower. Low-power AM stations located on a school campus are allowed to be more powerful, so long as their signal strength does not exceed roughly 14 to 45 µV/m (microvolts per meter) (depending on frequency) at a distance of 30 meters (98.4 ft) from campus. AM station classes were previously assigned Roman numerals from I to IV in the US, with subclasses indicated by a letter suffix. Current class A is equivalent to the old class I; class B is the old classes II and III, with class D being the II-D, II-S, and III-S subclasses; and class C is the old class IV. The following chart lists frequencies on the AM band, and which classes broadcast on these frequencies; Class A and Class B, 10,000 watt and higher (full-time) stations in North America which broadcast on clear-channel station frequencies are also shown. Because the AM broadcast band developed before technology suitable for directional antennas, there are numerous exceptions, such as the US use of 800 (kHz) and 900 non-directionally in Alaska, limited to 5 kW at night; and 1050 and 1220, directionally, in the continental US, and without time limits; each of these being assigned to specific cities (and each of these being Mexican Class I-A clear channels). In return for these limits on US stations, Mexico accepted limits on 830 and 1030 in Mexico City, non-directionally, restricted to 5 kW at night (both of these being US Class I-A clear channels). Canada protects all radio stations out to a signal strength of 0.5mV/m (54dBu), whereas only commercial B stations in the US are. Commercial B1 in the US is 0.7mV/m (57dBu), and all other stations are 1.0mV/m (60dBu). Noncommercial-band stations (88.1 to 91.9) are not afforded this protection, and are treated as C3 and C2 even when they are B1 or B. C3 and C2 may also be reported internationally as B1 and B, respectively. 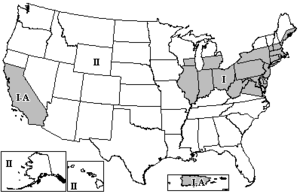 The United States is divided into regions that have different restrictions for FM stations. Zone I (much of the US Northeast and Midwest) and I-A (most of California, plus Puerto Rico) is limited to classes B and B1, while Zone II (everything else) has only the C classes. All areas have the same classes for A and D.
Power and height restrictions were put in place in 1962. A number of previously existing stations were grandfathered in, such as KVYB in Santa Barbara, California and WMC-FM in Memphis, Tennessee. Zone I in the US includes all of Connecticut, the District of Columbia, Delaware, Illinois, Indiana, Massachusetts, Maryland, New Jersey, Ohio, Pennsylvania, Rhode Island, and West Virginia. It also includes the areas south of latitude 43.5°N in Michigan, New Hampshire, New York, and Vermont; as well as coastal Maine, southeastern Wisconsin, and northern and eastern Virginia. Zone I-A includes California south of 40°N, as well as Puerto Rico and the US Virgin Islands. Zone II includes the remainder of the continental US, plus Alaska and Hawaii. In Zones I and I-A, there are no Class C, C0, or C1 stations. However, there are a few Class B stations with grandfathered power limits in excess of 50 KW, such as WETA-FM (licensed for Washington DC in zone I, at a power of 75 kW ERP), WNCI-FM (licensed for Columbus, Ohio in zone I, at a power of 175 kW ERP) and KPFK (Los Angeles, in zone I-A, at 110 KW ERP). All full-power analog television station transmissions in the US were terminated at midnight Eastern Daylight Time on June 12, 2009. Many broadcasters replaced their analog signal with their digital ATSC signal on the same transmission channel at that time. Official definitions of these classes are difficult to locate. The values above are inferred from the Industry Canada database. There is some ambiguity about the difference between Classes C and D.
Power-level limitations are not firmly enforced in Canada, and Industry Canada has been known to license stations for power levels much higher than the generally accepted limits. For example, CFRN-TV in Edmonton, Alberta operated on Channel 3 at over 600 kW but was not subject to international co-ordination due to its location 500 km north of the border. In Canada, the callsigns of all private TV stations have the -TV suffix. Most CBC Television and Télévision de Radio-Canada TV callsigns end in the letter T and have no suffix. A few Radio-Canada stations, purchased by the CBC from private owners, retain the old -TV callsigns. Canadian digital stations all receive the -DT suffix. (this includes CBC and Radio-Canada stations) The Industry Canada database shows -PT suffixes for the channel allotments for permanent post-transition digital operation but when licences are issued for these permanent digital stations, -DT callsigns are used. The LPTV (low-power television) service was created in 1982 by the FCC to allocate channels for smaller, local stations, and community channels, such as public access stations. LPTV stations that meet additional requirements such as children's "E/I" core programming and Emergency Alert System broadcasting capabilities can qualify for a Class A (-CA) license. Broadcast translators, boosters, and other LPTV stations are considered secondary to full-power stations, unless they have upgraded to class A. Class A is still considered LPTV with respect to stations in Canada and Mexico. The class-A television class is a variant of LPTV created in 2000 by the FCC to allocate and protect some low-power affiliates. Class-A stations are still low-power, but are protected from RF interference and from having to change channel should a full-service station request that channel. Television allotment (analog) TA An allocation of a frequency to a city of license for which no corresponding call sign or license has been assigned. FCC placeholder for possible future construction permits or frequencies allocated to non-US broadcast use. No call sign, identifier is a date (yymmdd) followed by a sequential two-letter value in the US FCC database. TV boosters TB Rare. These use the parent station's call sign plus a sequential number, such as WSTE1, WSTE2, WSTE3. Nameplates for on-channel repeaters bear the parent station's call sign, followed by "booster". See distributed transmission. If the station is digital, and has on-channel boosters, they would typically be named WSTE-DT1, WSTE-DT2, WSTE-DT3 and so on. Digital special temporary authority (STA) DS no specific suffix; uses same call sign as station making a request for permission from the FCC to use a channel, power level or transmitter location not permanently allocated for one particular station. Temporary assignments retain, unmodified, the call sign of the corresponding permanent allocation; this includes translator-style calls (a format, such as W55ZZ-D, based on RF channel number plus a sequential identifier) even on those temporarily moving to another frequency. ATSC 3.0 Futurecast Experimental Broadcasts EX Used for officially licensed experimental 4K/2160p Ultra HDTV broadcast stations, such as WRAL-TV's UHDTV simulcast, WRAL-EX. ^ "Clear Channel Stations". www.oldradio.com. ^ "FM Broadcast Station Classes and Service Contours". fcc.gov. 11 December 2015. ^ IFT: Disposición Técnica IFT-002-2016 "Especificaciones y requerimientos para la instalación y operación de las estaciones de radiodifusión sonora en frecuencia modulada en la banda de 88 a 108 MHz" is the current document that defines FM station classes and operating parameters in Mexico. ^ "FM Broadcast Station Classes and Service Contours". FCC. Federal Communications Commission. 11 December 2015. Archived from the original on 1 March 2016. Retrieved 28 October 2018. See Talk page. ^ "Congress delays DTV switch". 4 February 2009 – via Christian Science Monitor. ^ "Low Power Television (LPTV) Service". fcc.gov. 17 May 2011. ^ "Part 10: Application and Procedures and Rules for Digital Television (DTV) Undertakings" (PDF). ic.gc.ca. ^ IFT: Disposición Técnica IFT-013-2016 "Especificaciones y requerimientos mínimos para la instalación y operación de estaciones de televisión, equipos auxiliares y equipos complementarios", which became effective on January 1, 2017, provides the guidelines for the operation of digital television stations and their shadows. ^ "US CFR 47 Part 74G - 74.733 UHF translator signal boosters". gpoaccess.gov. ^ "TV Query Results -- Video Division (FCC) USA". www.fcc.gov.